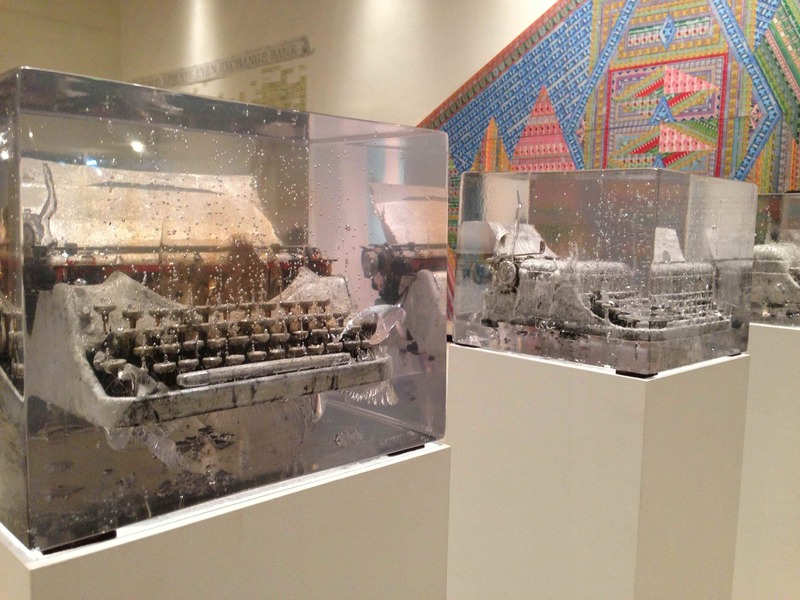 Installation view of Keiko Miyamori’s typewriters-in-resin (2012) with Ghost of a Dream’s The Price of Happiness mural (2011) made from losing US and Chinese lottery tickets. Just as they did in the Bronx last summer at the Andrew Freedman Home, No Longer Empty has invited artists take over the former Bank of Manhattan in Long Island City and let us contemplate the meaning of currency and exchange in today’s troubled times. Get over to see how 26 artists from 15 countries think about the American economy in How Much Do I Owe You, which is right next to the Queens Plaza subway station in the Clock Tower Building (29-27 41st Avenue). There’s lots of thought-provoking stuff from the moment you enter the door, like Ghost of a Dream’s The Price of Happiness mural. It depicts a typical American house made up of losing US and Chinese lottery tickets, and was made by the group during their stay in China. Check out more pictures of our favorites on Flickr. 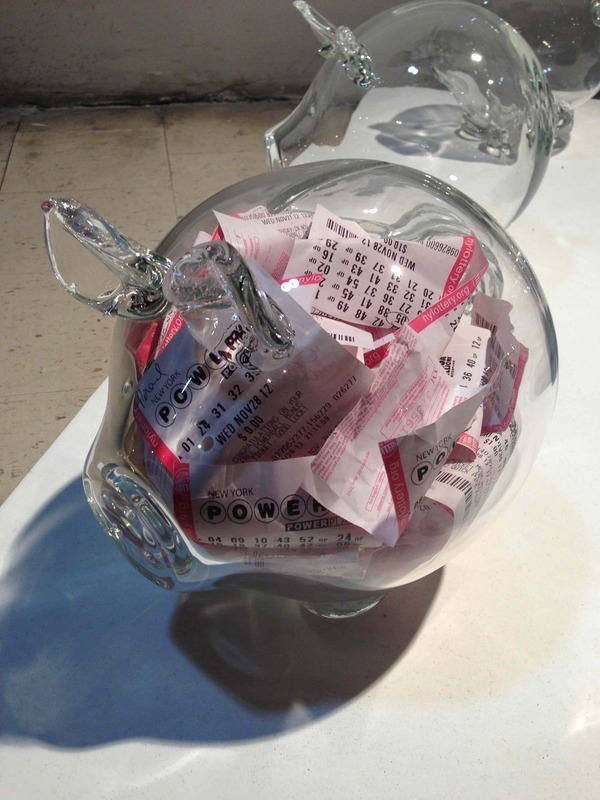 Installation view of Coleen Ford’s Saving for our Future (2012), glass piggy banks stuffed with lottery tickets. Erika Harrsch’s Mao Dragon Kite and several US Dollar Kites fly overhead. Keiko Miyamori’s typewriters-sunk-in-resin evoke historic systems and intractable problems. Susan Hamburger adorns a faux “bank” space (formerly where the bank tellers worked) with an old-style, symbol-filled mural that lays out relationships among Wall Street and Euro financial actors in the Greek debt crisis. When you round the corner to enter the open vault, you’ll be completely absorbed in watching Orit Ben-Shitrit’s mysterious performance video, Vive le Capitale, which was shot in HD among the vaults of the old Bankers Trust building at 14 Wall Street. Last weekend, the gallery was packed for a round-table discussion – one of several live events that No Longer Empty has scheduled here until closing on March 17. Alert: Lots of cool things are planned for the space on March 8, Long Island City Night of Armory Arts Week, so catch a tour or a provocative conversation. This entry was posted in Art, History, Museums and tagged arts, culture, events, finance, history, museums by mssusanb. Bookmark the permalink.